Announcing the 2018 Emig Award Recipient! 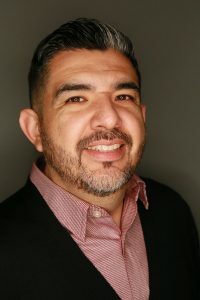 Danny C. Martinez, 2018 Emig Award recipient, will present during the ELATE awards session and will be recognized during the ELATE Luncheon on Friday, November 16, 2018, at the NCTE Annual Convention in Houston, TX. Winning article: “Imagining a Language of Solidarity for Black and Latinx Youth in English Language Arts Classrooms,” by Danny C. Martinez published in English Education, January 2017. Danny C. Martinez is an Assistant Professor in the School of Education at the University of California, Davis. His research explores the communicative practices of Black and Latinx youth in urban English classrooms, and teacher learning related to leveraging youth practices for facilitating expansive learning environments. His work is informed by his own experience as an English teacher in California and previously supported by NCTE’s Cultivating New Voices Among Scholars of Color. This award for exemplary scholarship is given to the author of an article published in English Education during the previous calendar year. The award is given in honor of Janet Emig, Professor Emeritus of English Education at Rutgers University, for her contribution to the field of English Education. The selection committee may consider published material of any length in English Education. The article to be awarded must have been published within the calendar year of issues being considered. Winners are notified in June and announced at the NCTE Annual Convention. Detra Price-Dennis, “Developing Curriculum to Support Black Girls’ Literacies in Digital Spaces,” English Education, July 2016. Gholnecsar E. Muhammad, “‘Inducing Colored Sisters of Other Places to Imitate Their Example’: Connecting Historic Literary Societies to a Contemporary Writing Group,” English Education, April 2015. Denise N. Morgan and Kristine E. Pytash, “Preparing Preservice Teachers to Become Teachers of Writing: A 20-Year Review of the Research Literature,” English Education, October 2014. Marcelle Haddix and Detra Price-Dennis, “Urban Fiction and Multicultural Literature as Transformative Tools for Preparing English Teachers for Diverse Classrooms,” English Education, April 2013. Anne Haas Dyson, ” What Difference does Difference Make? Teacher Perspectives on Diversity, Literacy, and the Urban Primary School,” English Education, May 1995.